Unleashed earlier this year, Nvidia's 3072 CUDA Core GTX Titan X was every enthusiast's dream until it was overshadowed by the GTX 980 Ti a few months later. Although the GTX 980 Ti is slower, it lets power users enjoy 4K gaming for $650 versus $1,000 for the Titan X. We got our first look at Nvidia's GTX 980 Ti reference card almost two months ago and have yet to check out a board partner's production model. Compared to reference designs by Nvidia and AMD, their partners usually come up with creations that run cooler and quieter. A perfect example of this is Gainward's GTX 980 Ti "Golden Sample", which features a 15% factory overclock that Gainward says provides 11% more performance on average. The GTX 980 Ti GS has a "Zero RPM fan design," meaning all three fans can be stopped until the GPU temperature rises to 60°C or above. Gainward also says its card operates 10°C cooler and is 6dB quieter under factory overclocked conditions. 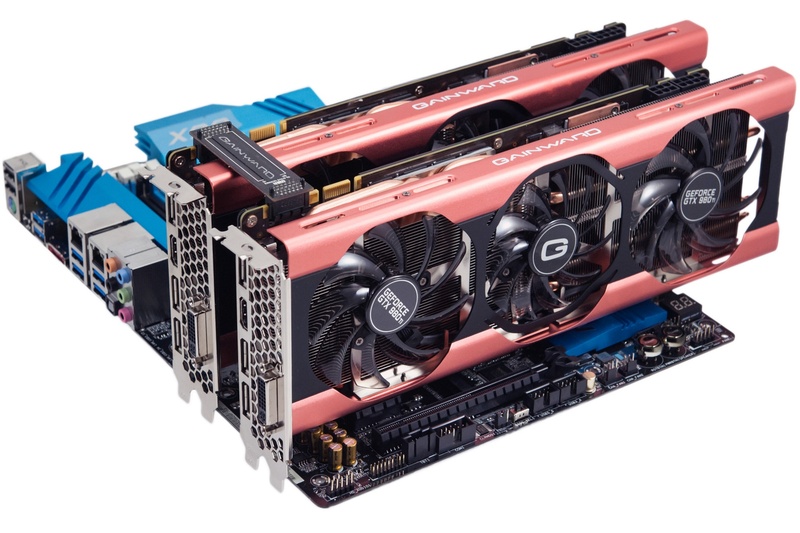 Not wanting to simply just revisit the GTX 980 Ti's performance, we'll be hooking up two of Gainward's cards for some SLI testing and to make the numbers even more interesting, we'll add a pair of AMD's Radeon R9 Fury X cards in Crossfire. The Fury X comes with the same $650 MSRP and one of them delivers virtually the same performance as a single GTX 980 Ti at 4K. While both cards can provide playable performance at 4K, many games dip down to and below 30fps, so folks looking to achieve smooth 4K gameplay will undoubtedly be eyeing dual GTX 980 Ti or Fury X cards. On the menu today we have 10 popular games to test at 4K. We'll measure minimum and average frame rates along with the 99th and 99.9th percentile frame times. The latest drivers from both camps will be used to ensure the best possible multi-GPU support. The GTX 980 Ti SLI and R9 Fury X Crossfire cards will be tested with default core and memory frequencies as well as a maximum stable overclocked configuration. The GTX 980 Ti SLI combo delivered a playable 43fps at 4K, though it did dip down to a mere 24fps on occasion. The Radeon R9 Fury X Crossfire setup might have been 5% slower when measuring the average frame rate but was actually 17% faster when looking at the minimums. Overclocked, the Fury X Crossfire setup was good for just a single extra frame while the overclocked Gainward GTX 980 Ti SLI configuration gained 12%, or 14% faster than the overclocked Fury X cards when comparing average frame rates. Looking at the 99th percentile data, we see that the Fury X cards pull well ahead of their GeForce rivals in Metro Redux. Here the overclocked Fury X pair was 18% faster than the GTX 980 Ti SLI overclocked configuration. The Gainward GTX 980 Ti SLI configuration averaged 84fps, 18% faster than the standard non-overclocked GTX 980 Ti SLI cards and 25% faster than the R9 Fury X Crossfire overclocked setup. The GTX 980 Ti SLI configurations pull even further ahead of the Fury X cards when comparing 99th percentile performance. Here the Gainward GTX 980 Ti SLI cards were 42% faster than the overclocked Fury X Crossfire setup.